Jicelle-Rae Sandan asked for donations for CPC instead of gifts for her 16th birthday party. Ashlyn Moore made wallets out of duct tape and sold them to raise money to purchase baby items for The Keim Center of Suffolk. 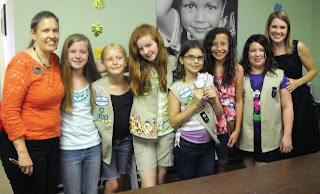 Girl Scout Troop #5455 (pictured) collected funds for CPC and joined the admin team to process their donation and learn more about LIFE! If you’d like to learn more about ways to help the ministry of CPC, visit http://cpcfriends.org/ourneeds.